VELCRO® Brand ONE-WRAP® straps are reusable, self-gripping fasteners perfect securing a variety of products including cable management and bundling sticks and pipes. 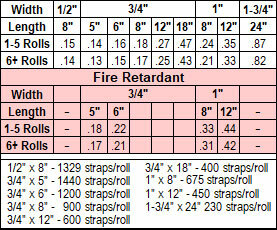 Fire retardant options also available. All colors are not available from stock in all sizes. See below for color availability. Prices shown are per strap. Minimum order is 1 roll. VELCRO® brand ONE-WRAP® Straps are high performance, reusable fasteners designed to making bundling cables easier and more cost effective then plastic ties. Die-cut with a wider tab with a slit on one end and a rounded tip on the other, these straps are supplied perforated on cross-wound spools. With 10 different colors, they are ideal for electrical and network cable coding.